Total War: Warhammer II is the greatest strategy game of all time. That is a bold claim, sure, but one that gets easier to make with every subsequent piece of DLC that bolsters Creative Assembly’s masterpiece. That is not to say the core game isn’t strong by itself. It manages to preserve what is special about the Total War series: the masterful blend of intense real-time battles with a complex and interesting meta layer of strategy and logistics. Layer in a tremendous helping of fantasy and lore from one of tabletop gaming’s most beloved series and you have a winner. 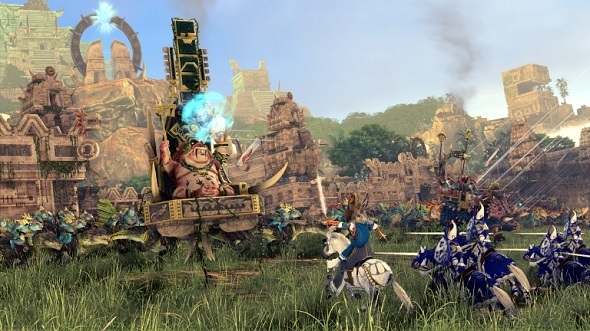 Find out how Total War: Warhammer became a story-driven series on the sly. But that was not obvious when the first Total War: Warhammer was announced. There was a lot of trepidation from fans of both series, especially when details about how each faction would play differently emerged, and how they would only be able to capture certain territories. The fear was that adding Warhammer to the Total War formula would be more oil and water than peanut butter and chocolate. The game’s launch silenced those criticisms. CA proved that a skillful twist on Total War’s core gameplay loop was exactly what the series was begging for, refreshing what had become a well-trod and almost stale formula. Instead of tilting Total War into fanciful nonsense, the liberal streaks of Warhammer added new layers of strategy to consider, all without fouling up the tactical and strategic warfare the developers had spent years perfecting. What happens during a lengthy, considered siege if both sides have dragons or griffons that render walls irrelevant? How do you protect your fragile artillery when the enemy can call bolts of deadly lightning from the sky? These are the types of fresh and exciting questions Warhammer introduced to Total War. Suddenly, the old playbook – establish a battle line, hit the flanks with cavalry, then erode their numbers with ranged units – had a dozen new chapters… and a lot of extra blank pages. 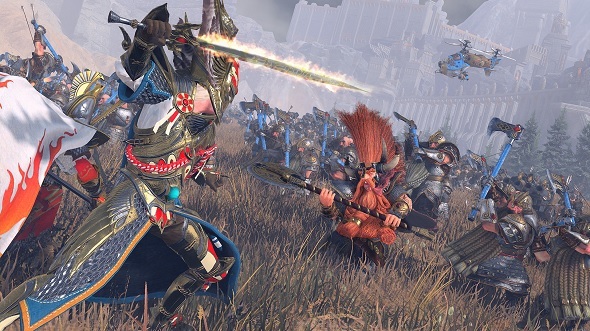 The first Total War: Warhammer game was flawed but not in ways that crippled it. Instead, the gaps in the first game only helped to fuel a sequel. Though CA didn’t wait for the second game to start shoring up some of those weaknesses. The dearth of factions and content was addressed with DLC that brought a number of new factions and other additions to the first game. Wisely, the developers carefully monitored their community’s reaction to the DLC, using it to inform subsequent updates, as well as the sequel. 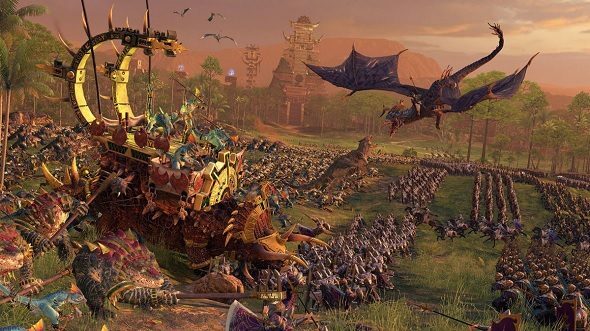 At launch, Total War: Warhammer II felt like a harmonious blend of Creative Assembly’s vision for the series blended with and tempered by fan reception of the first game. It, too, came with caveats, however: the initial dearth of content of the first game carried over, and some of the more obtuse mechanics (particularly the primary win condition, which involves manipulating a giant magical vortex) came under fire for trying to fix parts of the game that were never broken. But instead of patching over some of these problems, or removing the more meddlesome mechanics, the developers responded with a veritable torrent of content and changes. Remarkably, almost all of them represent major improvements. The Mortal Empires expansion, for example, effectively stitches together the maps from the original game and its sequel into a massive, sprawling game world (and, in the tradition of the Warhammer fantasy world, one that vaguely mirrors our own globe). 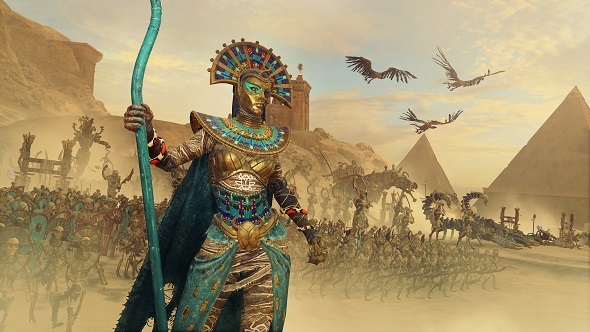 It not only adds all of the first game’s factions to those introduced in the sequel, including those added as DLC, but promises to include any future factions as well – like the Tomb Kings, who joined the fray in the most recent expansion. The result is a massive new mode with more than 100 factions vying for control of a space that now feels less like a game board and more like a fully-realised world. Mortal Empires also removes the unusual win conditions of the base game in favour of a more traditional conquest. In its current state, Total War: Warhammer II is an incredible achievement – a massive strategy game that is as challenging and deep as any of its contemporaries while evoking the best elements of a number of other genres. Raising a Dark Elf lord from a simple warrior to a black dragon rider, capable of summoning an eldritch overlord, is as satisfying in Warhammer II as it would be in any RPG. Watching your protege annihilate a legion of Chaos Daemons is as gratifying as some of the best moments in any action game. The focus remains firmly on those big, important strategy game decisions, though. Whether that takes the form of managing your armies and settlements on the overworld, carefully balancing income and public order, expansion and control, diplomacy and warfare, or micromanaging your troops at the tactical level, Warhammer II excels throughout.